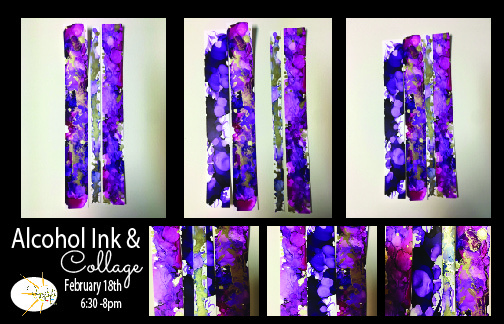 What’s next in Alcohol Ink …why Collage of course ! Come experiment with color , design and layout to create something gallery worthy! You’ll be able to create your colors and then your pattern based on what’s pleasing to you. You do not need to be an artist to enjoy going with the flow. We are always here to provide all materials and instruction throughout the entire class . Come enjoy , create and take home a personal piece of art. We provide free parking and aprons and as always you may bring food/ drink into the studio.